More recently, investigators have discovered that catechol-O-methyltransferase inhibitors can prolong the effects of levodopa, thereby limiting the off-time phenomenon. The motor dysfunction associated with Parkinson is the result of the degeneration of dopamine neurons in the substantia nigra. One method to restore dopamine in the brain is to administer levodopa, a precursor of dopamine that can cross the blood-brain barrier and be converted into dopamine. As dopaminergic cell loss becomes more advanced with disease progression, the associated motor symptoms often interfere with an individual’s ability to perform everyday activities, resulting in an inability to maintain control over motor symptoms that can negatively affect a patient’s quality of life. COMT is an enzyme that eliminates levodopa by catalyzing the conversion of levodopa to 3-O-methyldopa, a metabolite that has no known therapeutic value. 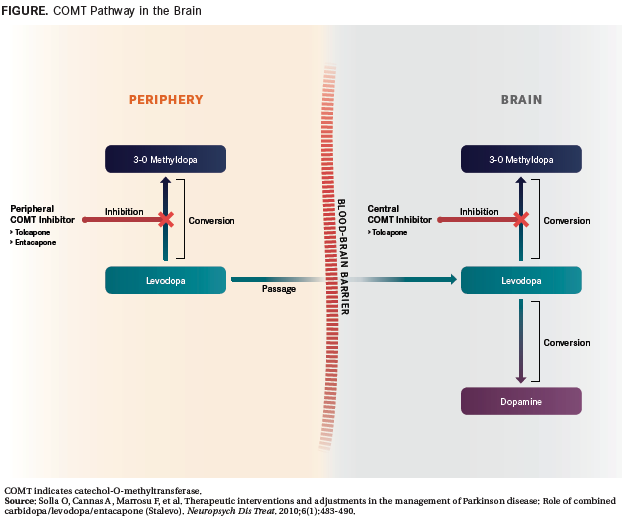 COMT inhibitors block this metabolic pathway in the periphery, thereby increasing the amount of levodopa that is available to be converted into dopamine (see FIGURE). 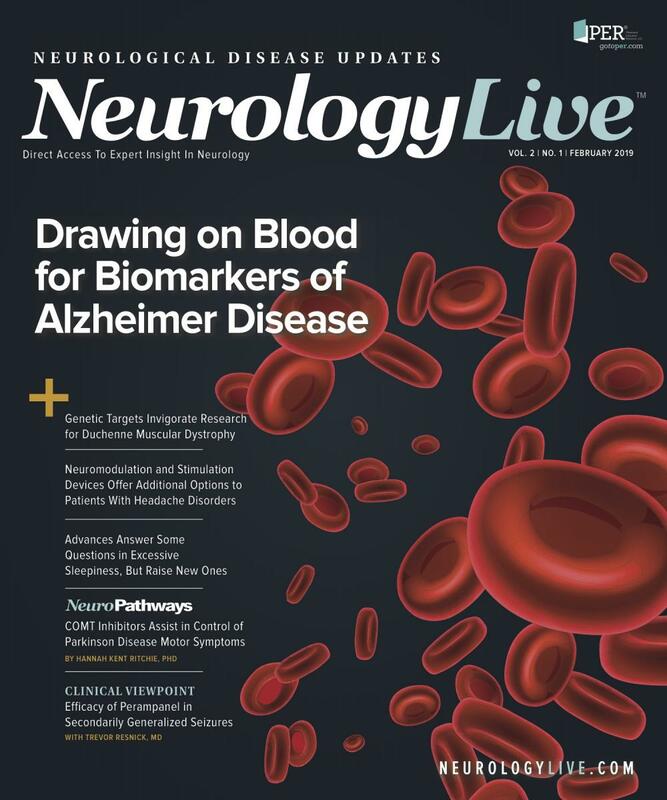 As a result of this process, COMT inhibitors enhance the therapeutic effect of levodopa by increasing its bioavailability and sustainability, thus preventing wearing off and improving clinical responsiveness.5 Importantly, COMT inhibitors have no direct effect on Parkinson symptoms, so they are effective only when administered in combination with levodopa. Tolcapone was approved for use by the FDA in 1997 based on clinical trials that demonstrated its ability to significantly reduce time in the off state (ie, reduce wearing-off complications) compared with placebo.11,12 Unfortunately, tolcapone treatment was associated with elevations in liver enzymes, suggesting that its use may lead to liver toxicity. The most common adverse effects associated with entacapone include nausea, urine discoloration, gastrointestinal disorders, and dyskinesia.6,19 Importantly, entacapone is not associated with hepatic dysfunction, so liver monitoring is not required during enta­capone treatment. Interestingly, although the FIRST-STEP trial did not find an increase in dyskinesia with the combination pill, the STRIDE-PD trial did find that the levodopa/ entacapone/carbidopa amalgamation worsened dyskinesia AEs.21 Nonetheless, the combination pill has been found to be effective and reduces the number of pills that must be taken each day, providing a more convenient option for patients. In the clinic, entacapone is the common first-line treatment strategy for Parkinson motor symptoms; however, it only moderately reduces time in the off state and must be taken with each levodopa dose. Tolcapone is more efficacious than entacapone, but its use is limited because of liver toxicity adverse effects. Opicapone (Ongentys; Neurocrine Biosciences) is a novel, once-daily COMT inhibitor that was approved for use in Europe in 2016 based on the results of 2 clinical trials, BIPARKI and BIPARKII.22 It is currently under development for use in the United States. The safety and efficacy of opicapone were established in the afore­mentioned randomized, double-blind, placebo-controlled phase 3 clinical trials.23-25 In the BIPARKI trial, opicapone was compared with placebo and entacapone in 600 patients with Parkinson disease. Opicapone was found to be superior to placebo and equivalent to enta­capone at reducing time in the off state. Specifically, it was estimated that opicapone reduced off episodes by an average of 60 minutes. The BIPARKII trial validated that once-daily opica­pone is well tolerated and more effective at reducing end-of-dose wearing off than placebo.24 Further, both trials demonstrated that the effects of opica­pone were maintained for 1 year, during which the levodopa dose was not increased. The most common AEs associated with opica­pone treatment included dyskinesia, constipa­tion, and dry mouth. In 2017, Neurocrine Biosciences announced that it would be responsible for developing and commercializing opicapone in the United States.26 After the manufacturer met with the FDA in 2017 to discuss a new drug application, the agency did not request that additional phase 3 clinical trials be conducted. As a result, Neurocrine Biosciences stated it hopes to begin the regulatory review process of opicapone in early 2019.26 It is, therefore, possible that opicapone may be approved in the United States as a novel once-daily COMT inhibitor treatment for Parkinson motor symptoms in the near future. “When thinking on the switch from entacapone to opicapone, patients should be closely monitored for development of dyskinesia; however, patients switching to opicapone will not show signs of urine discoloration, as would be the case with entacapone,” Thomas Müller, MD, head of the Department of Neurology at St. Joseph Hospital in Berlin, Germany, stated at the 2016 DGN Congress in Mannheim, Germany.4 “On the other hand, patients on opicapone have no need for liver monitoring, as is the case with tolcapone. 1. Parkinson’s disease information page. National Institutes of Neurological Disorders and Stroke website. ninds.nih.gov/disorders/All-Disorders/Parkinsons-Disease-Information-Page. Updated June 12, 2108. Accessed January 18, 2019. 2. Marras C, Beck JC, Bower JH, et al; Parkinson’s Foundation P4 Group. Prevalence of Parkinson’s disease across North America. NPJ Parkinsons Dis. 2018;4:21. doi: 10.1038/s41531-018-0058-0. 3. Politis M, Wu K, Molloy S, G Bain P, Chaudhuri KR, Piccini P. Parkinson’s disease symptoms: the patient’s perspective. Mov Disord. 2010;25(11):1646-1651. doi: 10.1002/mds.23135. 4. Poewe W. Levodopa-related ‘wearing off’ in Parkinson’s disease: current therapeutic options. Talk presented at: Deutsche Gesellschaft fürNeurologie (DGN) Congress; September 22, 2016; Mannheim, Germany. emjreviews.com/neurology/symposium/new-developments-for-parkinsons-therapy-with-comt-inhibitors. Accessed January 19, 2019. 5. Kaakkola S. Clinical pharmacology, therapeutic use and potential of COMT inhibitors in Parkinson’s disease. Drugs. 2000;59(6):1233-1250. doi: 10.2165/00003495-200059060-00003. 6. Comtan [package insert]. Basel, Switzerland: Novartis Pharmaceuticals; 2018. 7. Tasmar [package insert]. Quebec, Canada: Valeant Pharmaceuticals; 2015. 8. COMT inhibitors. Parkinson’s Foundation website. toolkit.parkinson.org/content/comt-inhibitors. Accessed January 19, 2019. 9. Stalevo [package insert]. Basel, Switzerland: Novartis Pharmaceuticals; 2016. 10. Rajput AH, Martin W, Saint-Hilaire MH, Dorflinger E, Pedder S. Tolcapone improves motor function in parkinsonian patients with the “wearing-off” phenomenon: a double-blind, placebo-controlled, multicenter trials. Neurology. 1997;49(4):1066-1071. 11. Adler CH, Singer C, O’Brien C, et al. Randomized, placebo-controlled study of tolcapone in patients with fluctuating Parkinson disease treated with levodopa-carbidopa. Arch Neurol. 1998;55(8):1089-1095. 12. Assal F, Spahr L, Hadengue A, Rubbia-Brandt L, Burkhard PR. Tolcapone and fulminant hepatitis. Lancet. 1998;352(9132):958. 13. Olanow CW. Tolcapone and hepatotoxic effects: Tasmar advisory panel. Arch Neurol. 2000;57(2):263-267. 14. Parkinson Study Group. Entacapone improves motor fluctuations in levodopa-treated Parkinson’s disease patients. Ann Neurol. 1997;42(5):747-755. doi: 10.1002/ana.410420511. 15. Deane KH, Spieker S, Clarke CE. Catechol-O-methyltransferase inhibitors for levodopa-induced complications in Parkinson’s disease. Cochrane Database Syst Rev. 2004;(4):CD004554. 16. Ferreira JJ, Lees A, Rocha JF, Poewe W, Rascol O, Soares-da-Silva P; Bi-Park 1 investigators. Opicapone as an adjunct to levodopa in patients with Parkinson’s disease and end-of-dose motor fluctuations: a randomized, double-blind, controlled trial. Lancet Neurol. 2016;15(2):154-165. doi: 10.1016/S1474-4422(15)00336-1. 17. Onofrj M, Thomas A, Iacono D, Di Iorio A, Bonanni L. Switch-over from tolcapone to entacapone in severe Parkinson’s disease patients. Eur Neurol. 2001;46(1):11-16. doi: 10.1159/000050749. 18. Entacapone to Tolcapone Switch Study Investigators. Entacapone to tolcapone switch: multicenter double-blind, randomized, active-controlled trial in advanced Parkinson’s disease. Mov Disord. 2007;22(1):14-19. doi: 10.1002/mds.21131. advanced Parkinson’s disease with motor fluctuation: a systematic meta-analysis. Eur Neurol. 20. Hauser RA, Panisset M, Abbruzzese G, Mancione L, Dronamraju N, Kakarieka A; FIRST-STEP Study Group. Double-blind trial of levodopa/carbidopa/entacapone versus levodopa/carbidopa in early Parkinson’s disease. Mov Disord. 2009;24(4):541-550. doi: 10.1002/mds.22343. 21. Stocchi F, Rascol O, Kieburtz K, et al. Initiating levodopa/carbidopa therapy with and without entacapone in early Parkinson disease: the STRIDE-PD study [erratum in Ann Neurol. 2010;68(3):412-413]. Ann Neurol. 2010;68(1):18-27. doi: 10.1002/ana.22060. 22. Efficacy and Safety of BIA 9-1067 in Idiopathic Parkinson’s Disease Patients. (BIPARKII).clinicaltrials.gov/ct2/show/NCT01227655. Updated October 19, 2015. Accessed January 19, 2019. 23. The Efficacy and Safety of BIA 9-1067 in Idiopathic Parkinson’s Disease Patients With “Wearing-Off” Phenomenon. clinicaltrials.gov/ct2/show/NCT01568073. Updated September 18, 2015. Accessed January 19, 2019. 24. Lees AJ, Ferreira J, Rascol O, et al;BIPARK-2 Study Investigators. Opicapone as adjunct to levodopa therapy in patients with Parkinson disease and motor fluctuations: a randomized clinical trial. JAMA Neurol. 2017;74(2):197-206. doi: 10.1001/jamaneurol.2016.4703. 25. Ongentys. European Medicines Agency website. ema.europa.eu/en/medicines/human/EPAR/ongentys. Updated February 2, 2017. Accessed January 19, 2019. Pipeline: clinical trials. Neurocrine Biosciences website. neurocrine.com/pipeline/pipeline-overview_old/opicapone/parkinsons-disease/clinical-trials/. Accessed January 19, 2019.